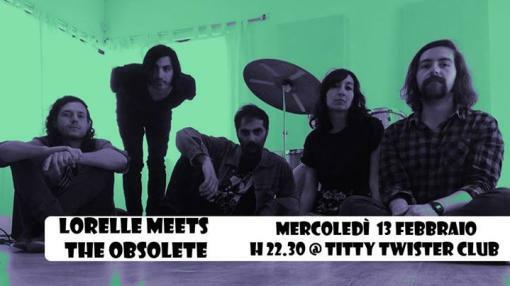 Lorelle Meets the Obsolete are Lorella Quintanilla and Alberto Gonzalez, arriving from Mexico City and speaking shoegaze and neo-psychedelic idioms that have nothing to envy to English and American cousins. On the contrary: Chambers, in its crude imperfection, find a good part of its charm in the constant tension that pushes and nourishes the songs, as in a exhausting competition to erode the advantage of position of the English-speaking colleagues. The landing at the Sonic Cathedral is therefore more than a confirmation. Dronic psychedelia that sizzles and grates incessantly, often leaving out of breath: this is the specialty of the Mexican duo, whose formula ranges in the color range that winds through Spacemen3, Loop and contemporary adventurers of the psych-gaze universe (Wooden Shjips, Moon Duo, Implodes and beautiful company). Between burning and dissonant raids of space-rock desert ("What's Holding You? ", "Music for Dozens"), garage rereadings ("The Myth of the Wise", "I Can not Feel the Outside") half between the graham stoner of the True Widow and the space sublimations of the Causa Sui ("Dead Leaves", "Grieving") and shamanic nursery rhymes ("Thougths About Night Noon"), the album flows that is a pleasure, showing off all the maturity of the band in managing the dynamics necessary to avoid any monochromacy. Walls of guitars, feedback and fuzz to tons, electric drones that sizzle from beginning to end: this is the sound of Quintanilla and Gonzàlez. A sound that, swaying between mescaline ecstasies ("Third Wave") and sonic fury (the splendid "Sealed Scene"), depicts a granitic psychedelic monument. Too much derivative, perhaps. But the impact is guaranteed: the stuning force of Chambers -bastino the thick spiers of "13 Flowers" to realize the potential of the duo- will not disappoint the lovers of the genre.